Russia’s top violin-makers have given RT an insight into a beautiful but dying craft, recalling its history and pondering its future. As the saying goes, many a good tune is played on an old fiddle. This is only possible thanks to a few talented individuals whose job it is to painstakingly restore classic violins. Amiran Oganezov is one such individual. 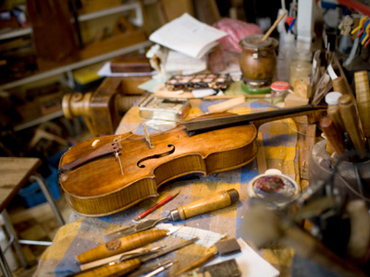 For the past 20 years, he has been restoring old violins and making new ones. It takes the master about four weeks to turn a piece of maple into a musical instrument. No machinery is used – everything is made by hand, from classic designs to something a little more experimental. Oganezov’s works are sold widely in Russia and Europe. Yet the musician has no formal education in violin making, because Russia cannot boast a single official violin-making school. Although Russian violinists regularly snap up top prizes at international competitions, the world has hardly heard of Russian violin makers. 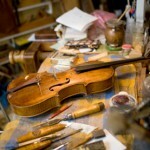 The country, however, does have a long violin-making tradition. It can be traced back to Moscow’s Glinka Museum of Musical Culture, named after the 19th-century composer Mikhail Glinka. The art of violin making has not changed much in almost 500 years, and a modern-day craftsman has to be a jack of all trades. The craft entails much more than the mere construction of a violin. The violin maker has to be a carpenter, a varnish maker, an acoustician, and has to play the instrument well enough to be able to hear and make the subtle tonal adjustments. Before turning to violin making, Amiran started out as a musician, as did his friend and colleague Mikhail Azoyan, whose workshop is next door. The violins he makes are snapped up at prices of up to $8,000, but his true love is making bows. He has a few tricks of the trade of his own. It is really all about the sound, says violin sensation Gayk Kazazyan, winner of a number of competitions in Russia and abroad. He agrees that Russia’s home-grown musicians prefer instruments made abroad. Violin makers like Amiran and Mikhail blame the lack of state funding and support for the trade. However, as long as their work remains in demand, they hope the profession will live on, and the country’s violin makers will eventually stop playing second fiddle on the world stage. This entry was posted in Art, Art Collection, Musical Video, Soul of Russia on May 24, 2011 by admin.